John Cole thinks Red State (a site for Republicans) has finally published their first “semi-sane” article in quite a while. Sorry John, I have to respectfully disagree. The article in the question is another election postmortem. Cole thinks it’s noteworthy because there was no “tribute to Palin, no calling Democrats terrorists or terrorist-enablers, and no questions about Obama’s birth certificate.” True. They trusted us with national defense. 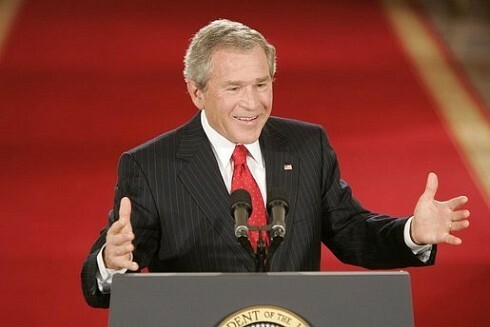 That more than anything else got GWB re-elected and let us hold on a little longer. Well, we blew that too. Kicking Rumsfeld to the curb right after the election and changing the whole strategy is a pretty compelling case for having had the wrong strategy for some time and not being willing to admit it for political reasons. There went our credibility on national defense. Nothing about launching a war on false pretenses. Nothing about prosecuting it in such a way that we alienated our allies and moderate Arabs the world over. I guess McCain would have had a shot had Bush not fired Rumsfeld? As for the hot-button issue of 2008, the imploding national and world economy, the article says nada. Nothing about pushing reckless deregulation and pumping more air into the housing bubble. I would like for there to be an opposition party in America, but if Republicans don’t start looking at the actual reasons for their fall (sorry, bloated budgets don’t count), then they’re hopeless. This entry was posted on at 12:31 pm, filed under U.S., U.S. Politics and tagged deregulation, GOP, Housing Bubble, John Cole, Red State, Republicans. Bookmark the permalink. Follow any comments here with the RSS feed for this post. Both comments and trackbacks are currently closed. Republicans really only have one thing now that they push which is cutting taxes. They are broken records about it. States are going bankrupt, cities too, and Republicans want to cut taxes. There is a time and a place for tax cutting and I think its good for the Republicans to pull the Democrats back every now and then. One thing about the Democrats though, they are willing to change their policies with the current economic climate. Republicans just want to call them socialists and cut taxes and deregulate which is what has gotten us into this mess. Cutting taxes are great, when taxes are in fact too high. If there is some evidence that they are, then we should cut them. But right now Americans are demanding more services from their government, so something has got to give.